BPA is struggling with high-water operations in the Columbia and Snake rivers and too much wind capacity. The result is too much electrical generation and too much uncontrolled spill that produces too much nitrogen gas in the water that can be detrimental to both juvenile and adult salmon. Wind-power capacity could double by 2015. Wind, a renewable resource that does not directly impact salmon, is being considered for curtailment partially because of generation from the lower Snake River dams. BPA and its federal partners are confronted with listed salmon and what to do about them. For Snake River salmon, the most important populations in the Columbia Basin, lower Snake River dam removal is the best recovery option. 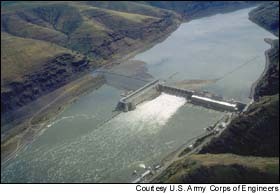 A way out of this dilemma -- take 1,000 aMW (average megawatt) out of the federal hydropower system via lower Snake River dam removal. That will reduce over-generation and allow the growing wind industry to contribute the much needed renewable resource. No dams, no nitrogen.